Life Point: Jesus performed miracles through the power of God. Can be done at all ages; but geared more for older kids (grades 4-5). Illustrates the idea of being able to trust someone else. A fun craft that really puts together the story and what you will be teaching the kids this week. It would make a good wrap up craft. This would be better for younger kids. It might be good to have a blanket or something to put in front of the chosen child to make it better. Put a small object in a paper bag. Ask one child to look in the paper bag and tell the class what he sees. Ask the class, “Do you believe him?” and let children respond. Secretly put a new item in the bag and ask five children to look inside and tell the class what they see. Ask, “Is it easier to believe five people rather than one when their answers are the same?” Most children will respond yes. Tell them that even though all 10 disciples told Thomas that Jesus arose, he still didn’t believe. Have students make palm branches out of different colors of green and brown paper. You could bring in scrapbook paper in these colors as well. They then would write out the song that is in the picture and color green and brown behind it to represent the ground of the road. The site shows a more extensive project but you could simplify it by just making the cross of nails. You of course would want to be very careful with the sharp nails and wire. I think it would be something the older kids would love and help remind them of what Jesus did. Cut three pieces of craft wire to measure about 6-inches long each. Hold the three pieces of wire together. Wrap one end of one piece of wire around the other three to hold them together. Braid the three strands of wire together loosely until you have reached a spot about two inches from their ends. Wrap the end of one piece of wire around the other two to hold the braid together. Cut the ends of the wire off. Cut five pieces of brown cord to each measure two inches long. Tie the pieces onto the bracelet evenly spaced around. These will be the thorns of the crown. Use scissors to cut the ends of the knots so the cord looks like thorns. Tightly wrap brown cord over the ends of the bracelet to cover the ends of the wire. Tie the cord to secure it in place. The site has all the pieces for printing and instructions to make this wreath. This would be something good to make this week and then can talk about it with their families on Easter the next Sunday. This pdf has everything you need to play this game. Including the questions and answers. I would play this with older kids as some of the questions are kind of hard but they do give the scripture reference if you wanted the kids to look up the answer in their Bibles as well. 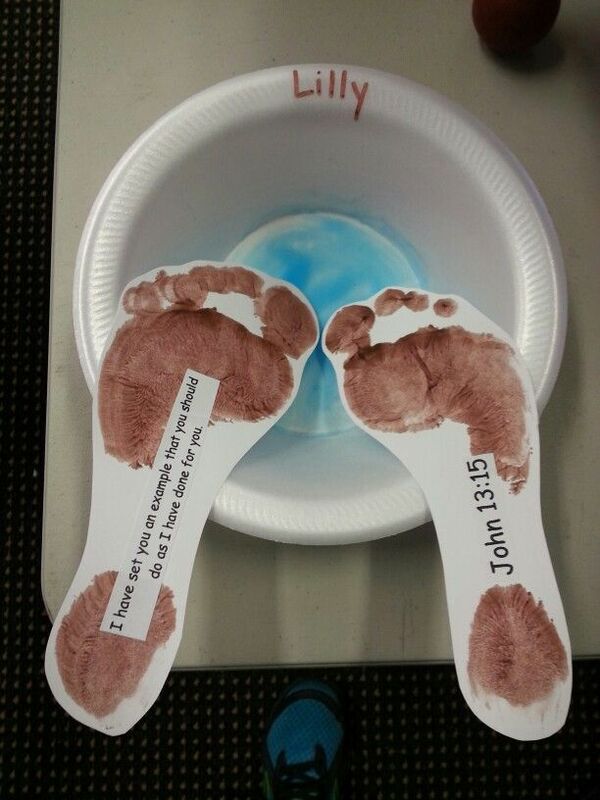 Kids design serving trays as they learn how Jesus showed his disciples how to serve others. What Kids Will Need: aluminum pans, white paint, paintbrush, tempera paint, paper plates, rubber craft stamps, rickrack, craft glue, marker, snacks. Preparation: A few days before this activity, paint each aluminum pan white. On the day of the craft, squeeze a little paint onto several paper plates, and place these within children’s reach. What Kids Will Do: Give each child a white aluminum pan. Write each child’s name on the bottom of his or her pan. Guide children in lightly dipping rubber stamps in paint and then pressing the stamp once or twice on a paper plate to remove excess paint. Let children stamp designs on the white pans. To trim pan edges, children may glue rickrack around the perimeter. As children work, let them brainstorm ideas for using their trays. While trays dry, ask children to assist you in cleaning up and putting away craft supplies. Open your Bible to John 13:1-17, and tell the story of Jesus washing his disciples’ feet. Then ask: What does it mean to serve someone? Why do you think Jesus washed the disciples’ feet? What do you think Jesus hoped the disciples would learn about serving? Say: Jesus washed the disciples’ feet to show them how much he loved them. He wanted his disciples to learn to serve and love others too. Jesus wants us to serve and love people, just like his disciples did. We can show love by serving and helping others. Let the children serve each other snacks, using the trays they just made. Before class cut water drop shapes from blue card stock so that they fit inside the cup. Make enough water drops so each craft has enough to write one word of the verse on each water drop. Punch holes at the top of each water drop. In class have your children string the water drops in order on the string tying each water drop to the string before they add another water drop. Have your children color the cup and write the Bible verse on one side. Punch a hole in the bottom of the cup and string the yarn through the hole. Tape the string to the bottom of the cup. This craft is going to be better for 2nd, 3rd, and 4th graders because it is semi-complicated. All the instructions as well as the printables are on the website. It is pretty cool but will be time consuming so plan accordingly. Teach children about the woman at the well from John 4. For this game, every child will need two cups (one with water, one without) and a drinking straw. Have kids stand against one wall, and give each child a straw. Place cups with water on the ground near each child while placing empty cups on the floor about 10 feet away. Demonstrate how to hold water in the straw by dipping it in the cup, plugging the top with a finger, and lifting the straw. On “go,” give kids 60 seconds to see how much water they can transfer to their empty cups using only their straws. When time’s up, read aloud John 4:7-10. Then say: Talk about a time you were really thirsty and how you quenched your thirst. Read aloud John 4:11-14. Say: The woman drew water at the well, just like you drew water with your straws. Jesus, though, talked about a different kind of water. Kids love our Sunday School resources! What “water” do you think Jesus talked about? What kinds of “thirsts” do you think Jesus’ water could quench? Hold up a cup of water and say: Just like the water the woman got out of the well, the water in this cup will run out but Jesus’ living water never runs out! Let each child choose a bottle of water or juice and give them a long piece of paper and markers to write and decorate the bottle with JESUS GIVES US LIVING WATER. Tape their piece of decorated paper onto the bottle to remember today’s lesson. I need four volunteers to come upfront for a cracker eating challenge. If you want to be picked, you have to like crackers. The four of you are going to race and see who can eat the most saltine crackers in two minutes. Whoever completely swallows the most crackers wins. You might notice the water bottles near the crackers. Well, you can’t have any water. Sorry. The rest of you in the audience, your job is to cheer for all four of them. Make some noise. After the competition congratulate the winner. Say – I have a question for all four of you. What does your mouth feel like right now? (Get responses) How thirsty are you? (Get responses) What would you think if I said you couldn’t have any water till after church? (Get responses) Well, that wouldn’t be fair of me, would it? I can see you’re very thirsty, so each of you, go ahead and take a bottle of water to drink. Enjoy! You can go back to your seats now. You can print off a trunk or have the students draw a trunk and branches. Then have students finish the tree off with fingerprints. Then you can either have the verse printed out or have them write it at the bottom of the page. The tree will remind them of Zaccheus and remember to love people who are even hard to love at times. 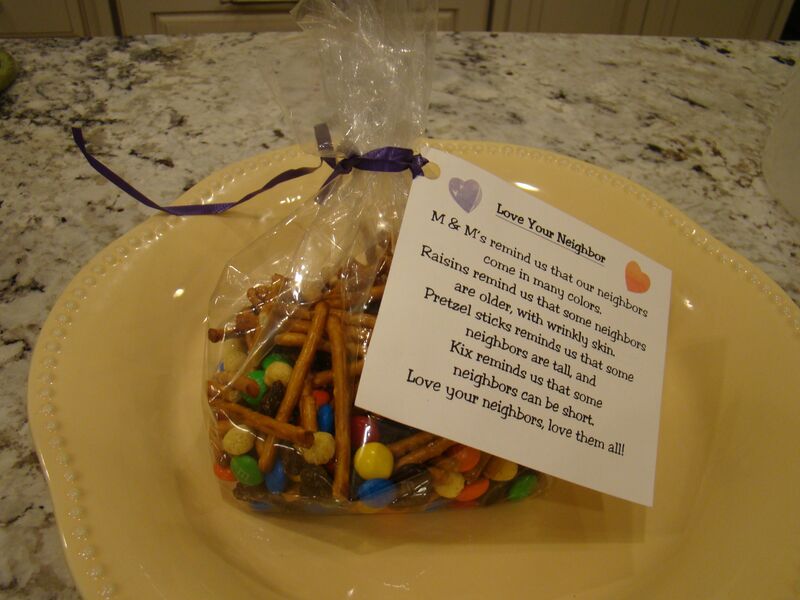 Craft and Book: What if Jesus came to my house? Bring two magnets that repel on one side and attract on the other side. Have the magnets face the repelling side. Try to slide the magnets together. As they repel, share how most people feel like this towards people who are unlovable. Now turn the magnets so that they attract. Explain that Jesus wants us to love the unlovable and pray for those who want to hurt us. Show the kids how the magnets stick together. You can illustrate the need to love others, including enemies, by placing hearts, cut from construction paper, on one end of the room. Members of each team take turns running to the hearts, taping one on to their shirts and running back. The team that completes this relay first wins. You can use this race to discuss how the students may not like everyone on their team but they had to work together to win. The site has the pattern for the craft as well as how to do it. You could print the memory verse on the hearts or on the cross. A lot of things would be good to choose. But if you were only allowed to choose two things you would probably choose the two things that are most important to you. In today’s story we are going to learn about two sisters. One chose to do a good thing and the other chose to do something more important. Provide each child with a small container with a lid, like a glass baby food jar or small plastic container. Help each child to put three objects inside the container, like three rocks or three marbles. Then, fill the remaining space in the container with something smaller, like sand or rice, and then put on the top. Now, have the children empty the contents of their container into an extra bowl. Ask them to put the sand or rice in first and then the larger three objects (marbles/rocks) and place the lid back on. They won’t be able to do it! Now try putting the larger three objects in first and then the smaller material again. Everything should fit just fine! Discuss how the three large objects are like God, Jesus, and the Holy Spirit. If we put those things “first” in our life and then add everything else (family, toys, school, tv, sports, etc.) everything seems to fit a whole lot better than if we try to do it the other way around. Ask the children if they have any idea about what they can do to try to put Jesus first in their life. Provide each child with a paper circle (or help them to make their own). Work together to make a pie chart/illustration that shows how they spend their time. For example, if most of their time is at school, color that in as the largest piece. Use other colors and pieces to show how much time is spent on sleeping, eating, sports, homework, family, tv/video games, friends, etc. Ask the children how the amount of time they spend focused on Jesus compares to the time they spend doing everything else. Brainstorm some ideas about how to spend more time with God. Make a list on the other side of the circle of the most important things in life. Challenge the children to “put those things first” as much as possible. Place many items around a designated area – such as toys, books, Bible, Bible verses, Christian plaques, magazine pics, etc. Send children out to the designated area, two by two, to find something IMPORTANT (just one item per child to begin with) and bring their item back to the classroom table. Send 2 or 3 more children out to find something IMPORTANT until everyone has brought an IMPORTANT item back to the table. Gather around the table and talk about the IMPORTANT ITEMS and why. Discuss today’s lesson! Give out M & M’s for “Mary” and “Martha” and as children can answer questions about today’s Bible lesson, they can be given M & M’s to remind them of the story. Form teams of four. Choose one person from each team to be the hurt man who was robbed and beaten on his way to Jericho. Have the hurt people lie on the floor at the end of the room opposite their teams. Give each team a supply of 10 to 15 adhesive bandages and a cup of water. On “go,” teams race with their supplies to their hurt team members. The goal is to put 10 bandages on the hurt neighbor, give him or her a drink of water, and carry the person back to the starting point. This is such a simple and genius way to tell this story! I have seen it a few different places, but I have no idea where the concept originated. All you need is four strips of card stock or tag board, a hole punch and three brads. I found the version displayed below here. Setup a few cones staggered across the room. Have all the children line up at one end of the room. Choose one child to be “Jesus” and stand at the other end of the room. Choose four children to be the four friends. Their task is to each hold a corner of the pillowcase, carrying the doll or stuffed animal, and weave around the cones to bring their “friend” to Jesus. If they drop their “friend” they must go back to the beginning. When they reach the end, have the child who is “Jesus” repeat after you saying, “Your sins are forgiven. Arise, take up your bed and walk.” Everyone claps and celebrates, thanking Jesus for healing their “friend”. Repeat, giving each child the opportunity to be a “friend” and/or “Jesus”. This man’s legs did not work. He could not walk. His friends had to carry him on his bed. Jesus healed him! He forgave the man’s sin, and told him to take up his bed and go to his house. To prepare cut out the man templates, and cut felt into 4 1/2″ x 2 1/4″ rectangles. Punch a whole in the center of the man’s body. In class, help the children glue their felt pieces to craft sticks. Have them color the man, then attach the the man to the felt with the brad. The picture is pretty self explanatory. If you do this please put up an allergy alert. Hide vegetables (real or plastic) in small batches around the room; hide at least one vegetable per kid. Allow the group to move around the room together, searching for the vegetables. Give instructions such as “look higher,” “look lower,” “move to the left,” “turn around,” and so on. When kids find vegetables, they may each claim one and bring it to you. Allow kids to hunt until each kid has claimed a vegetable. Place a variety of different vegetables and fruits into opaque plastic bags, one kind of food per bag. Invite a child to reach into the bag and feel the mystery food. She will then describe what she feels, and the other kids will guess what the food is. If they are correct, select a new volunteer, allowing him to reach into a new bag and describe the next food. If they are incorrect, allow the kid feeling the food to guess what it is. If she is incorrect, open the bag and show everyone the food. For more of a challenge, consider prepping the foods in different ways before placing them into the bags. You can try slicing, peeling, or chopping different foods to make them harder to guess. Form two teams of kids. At one end of the room, place two baskets. Instruct the kids to line up at the other end of the room. Provide toy fruits and vegetables for each team, one per kid. Kids will take turns tossing their vegetables or fruits into their team’s basket. If a kid misses, he must toss again until his fruit or vegetable lands in the basket and stays in. Then that child will move to the end of the line, and the next kid will toss her fruit or vegetable. If you are using chairs, place them in a circle. As kids arrive, give each one the name of a vegetable (carrot, zucchini, lettuce, onion, celery). Tell kids to stand (or sit) in a circle. Choose one kid to stand in the middle of the circle. Call out a vegetable; kids with that name will switch places. The one in the middle tries to get one of the vacated places. Whoever ends up without a place stands in the middle. After a few turns, call out two vegetables to switch. Call out: “Tossed salad!” Everyone switches places. Comment that vegetables will be a part of the Bible story. Because Esther was a queen you could make a crown in the class. The link below has a crown template or you could find another online. Talk about how God had a plan for Esther life and her to be queen. This craft lets the children write a law they would make if they were to become king or queen. It shows how to make it but doesn’t have a template for it so you would have to make it. We have lots of brown paper in the resource room or if you wanted to print and glue on brown paper sacks we have those as well. An activity for Esther is working on balance and grace. It’s a great activity for your kids, and lets them think about Esther undergoing a YEAR’S worth of beauty treatments, and it wasn’t just baths and perfumes, it was also training in how to walk and talk. The holiday that is celebrated by the Jews because of Queen Esther saving them is called Purim. The website below has the information on how this holiday came about and what they do. It also has the recipe for this pastry if you would like to make it and bring it in for the kids to try. You could talk about the different customs of the holiday.